I can’t definitely say that I’d never heard of Leonard Cohen until 1980. I’ve seen YouTube clips of him on TV series that I know were required family viewing in the 1960s, but if he ever made an impression I quickly forgot him. However, when a new boyfriend introduced me to Songs of Leonard Cohen and Songs of love and hate I was hooked. Thirty six years later, I can’t say John (for it was he) and I have embraced all of each other’s musical tastes. I have never reconciled myself to Captain Beefheart, and he can’t understand why I find Abba so entrancing, but we share a good solid core and Leonard was the first. And the best. Neither of us had ever seen him perform, so you can imagine our joy when he started touring again in 2008 – and then our sorrow when we realised that his only UK dates were when we were on holiday in the US. Not to worry – he would be performing in Dublin before we left. I still class that weekend as one of the most special in my life. While we were away, we got an excited message from a friend, another Cohen fan. Good news! New dates! Leonard was coming to Glasgow in November. We immediately ordered tickets. I remember the concert was the day after the US election in which Obama got in for the first time. There was a sense of elation from both band and audience at the line Democracy is coming to the USA. That’s quite poignant to look back on too. In 2012, we travelled to Berlin where the stand-out line in terms of audience participation was First we take Manhattan – then we take Berlin. This left me with the ambition, sadly unfulfilled, to belt out the same line in Manhattan some day. 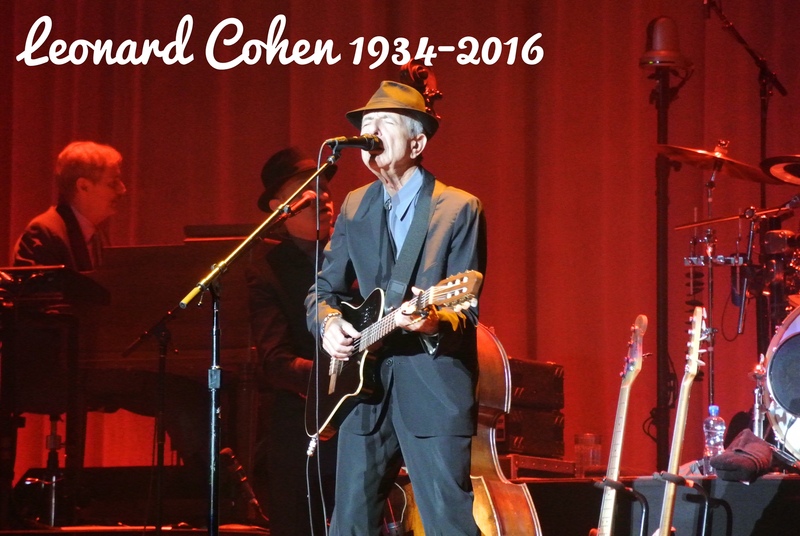 However, we did get one more chance at a Cohen concert towards the end of his touring days when we travelled to Dublin again in 2013. Leonard was still in such good shape then. He skipped and danced, bent down on his knees – and got back up again without a struggle! When his former lover and muse, Marianne Ihlen, was dying earlier this year it worried me that he told her that he wouldn’t be far behind her, then I heard that he had said in an interview that he was ready to die. He recanted this in his final interview at the launch of his last album just a few weeks ago, but he looked terribly frail and, from comments made by his son Adam, was in a lot of pain and not very mobile. I was shocked at the decline in just three years, but I suppose that’s old age and we all have to face it. I’ll leave you, not with my favourite Leonard Cohen song which would be far too hard, but with this little gem that I discovered a few years ago via the wonderful site, Cohencentric: I love Leonard Cohen. Leonard – you might, or might not, have been ready to die, but we certainly weren’t ready to lose you. So long, and thanks for all the memories. Beautiful tribute. So sad to see them go, the legends. 2016 is a sad year. Lovely tribute and so sad at the same time. Thanks, yes, he is a great loss. Great memories of this troubadour. That’s how I like to think of him. Nice tribute to Leonard Cohen. I have to confess, I don’t know many of his songs. Seeing how much you and so many others enjoyed his music, I may have to remedy that and check out his work. Thanks – glad you liked the song. Thanks Hilary, glad this helped you share some memories.